Fruit juice contains a large amount of sugar which raises blood sugar levels very quickly. Therefore, people with diabetes are usually best to avoid drinking fruit juice. As a general rule, eating whole fruit is healthier than drinking fruit juice or fruit smoothies. Once regarded as a healthy drink, recent research indicates that that regular consumption of fruit juice may increase the risk of developing type 2 diabetes. Sugar levels in fruit juice can cause a significant spike in blood sugar levels, increasing the risk of hyperglycemia (too high blood sugar levels). The glycemic index, which is used to reflect the impact on blood sugar levels of individual foods, places orange juice between 66 and 76 on a scale of 100. This makes fruit juice a high GI drink and high GI foods and drinks are best avoided by people with diabetes under most circumstances. One situation in which fruit juice can be useful is to raise blood sugar quickly in response to hypoglycemia (too low blood sugar). 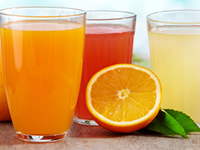 Fruit juice is high in a form of sugar called fructose. Fructose needs to be processed by the liver and research suggests that a diet that is high in fructose may cause the liver to be overwhelmed, leading to problems such as non-alcoholic fatty liver disease and type 2 diabetes. It is important to note that table sugar is made up of 50% fructose and 50% sucrose. There a diet high in sugar will also be high in fructose. These points are significant because it means that over-consumption of fruit juice or having fruit juice in addition to a high sugar diet may increase the risk of health problems. Fruit juice has some benefits, however the benefits are generally outweighed by the disadvantage of the sugar content. Fruit juice is a good source of nutrients such as vitamin C. However, it is better to get vitamin C from eating small portions of whole fruits or eating leafy green vegetables. Leafy greens have a strong advantage over fruit or fruit juice in that they have much less effect on raising blood sugar levels. It is better to consume whole fruit than fruit juice. Whole fruit has the advantage of having soluble fibre for instance. Soluble fibre can helps to improve digestion and slows the rate of the rise in blood sugar. It also means that whole fruit represents a less concentrated form of sugar. It should be noted that people with diabetes should approach whole fruit with some caution too as many whole fruits have a lot of carbohydrate. The bottom line is that whole fruit is better than fruit juice but should be eaten in moderation. Small portions of fruit are better. Does drinking fruit juice increase the risk of diabetes? A study conducted in 2013 suggested that drinking three portions of fruit juice a week was associated with an eight per cent increase in diabetes risk. Conversely, eating blueberries, grapes, apples and pears was associated with reduced risk. The researchers found that replacing fruit juices with three helpings of certain whole fruits a week would lower the risk by seven per cent. Some whole fruits reduced the risk more than others. For grapefruits and bananas, there was a five per cent decrease, whereas blueberries reduced the risk by 26 per cent. Juiced non-starchy vegetables have a lower glycemic index and contain fewer carbohydrates than juiced fruit. The glycemic index of whole vegetables is lower still. As with fruit, a proportion of the fibre from whole vegetables is likely be lost during the juicing process. Juiced vegetables can play a part in a healthy diet, particularly if juiced vegetables do not replace having whole vegetables.